Self-care in 5 minutes. Do you think it is possible? I do. I actually know it is possible and really beneficial. As a mom, we have such an important job of raising kids and that is not easy. In addition, adding the responsibilities of life in general such as home, work, relationships and friends it is overwhelming. 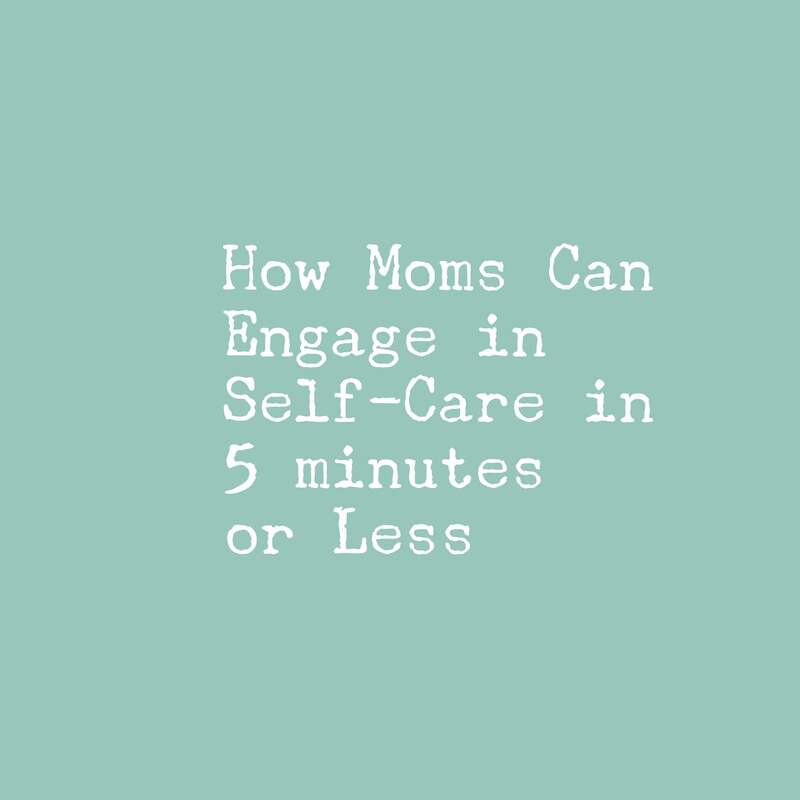 It is necessary for everyone to engage in self-care but moms truly need to take care of themselves because if they do not it is harder to take are of the kids. When you are on an airplane, what to does flight attendant always say? Put your mask on first! As moms and women, we are constantly helping and caring for others. Realistically, we only have so much we can give to others. At some point, we become tired, angry and maybe resentful. I define self-care as taking care of myself emotionally, physically, and spiritually with a purpose of becoming a better happier mom (or really person in general-but hey this is a mommy blog). You can read more about my self-care journey here). I believe there are two levels of self-care. Both are important. The first level is taking care of your basic needs. This includes making sure you are getting enough sleep, exercise and eating nutritious foods. Often as moms, these are the first things to go, which does impact your mental health. The lack of sleep is expected for new moms, but it affects you especially when it continues on for months. For many that magic number of 6 weeks or 10 pounds does not mean sleeping through the night. When I became a mom, sleep was hard, I found little time to cook, let alone eat healthy foods and I didn’t work out. Why would I, I didn’t before I had kids, I certainly wasn’t going to now. But the thing is these things matter. Sleep, healthy foods and exercise are the best ways to deal with stress. Someone doesn’t need to join a cross fit gym to get exercise, but taking a walk most days can help. The second level of self-care is finding activities that give you joy outside of your role as a mom. Finding ways to rejuvenate can help you be more focused when you are in mom mode. Things like reading, mediating, sitting in silence, journaling or calling a friend are examples of the second level of self-care. My question is why not? You have to start somewhere, right? It is easier to take 5 minutes to prepare a healthy breakfast then it is to begin a diet and take away all the foods you enjoy. It is easier to say yourself, I am going to begin my day by reading a daily meditation then it is to say I am going to read this whole book in a week. It is easier to say yourself, I am going to take a 5 minutes to sit in silence and breath deeply then it is to take a long bath. It is about starting somewhere. I also believe that doing something each day is helpful for overall health. 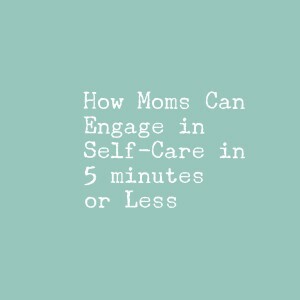 Often, when we think of a moms self-care we think of getting a massage or having a girls night. Although those have their place, they do not provide the everyday need, relaxation and stress management. You can read more of my thoughts here on the idea of self-care and remember to take my self-care quiz here. Think of a pitcher of water. When we are constantly doing for others and pouring our water out, there will eventually be no more unless you refill the pitcher. Self-care is the refilling of the pitcher. When we engage in self-care, we fill ourselves up with things that make us feel better, bring joy, calmness and serenity. When we feel better about ourselves, we are then able to pour into our roles as moms, partners, employees, friends. We are better at these roles. Self-care also provides grace. You can become less hard on yourself when things don’t go as planned. It leads to becoming less angry, resentful and stressed. Have I convinced you yet? Here is a list of several things you can do to engage in self-care in 5 minutes or less. Journal for 5 minutes. Don’t know what to write, pick a prompt word such as hope, joy, motherhood. It can be anything. Not sure where to start, guess what. There is an app. Here is a list of various apps that can be helpful to you all recommended by therapists. May is soon approaching, which will begin our second year of our 30 day Happiness Challenge. Read about last years here. Also, remember to like my Facebook page, as I will randomly put up self-care challenges. Please note that this article does not replace mental health therapy. If you are need of services, please find a local therapist. This entry was posted in happiness, self care and tagged #intentional living, #mommy's, 30 day challenge, children, mommy, mommy self care, self care.